The Great Wall of China has a new rival, thanks to “China’s richest village”, Huaxi. Photographs posted on several Chinese news websites show a replica of the Great Wall winding its way over hills near the village of Huaxi in Jiangsu Province, about 100 miles from Shanghai. Other new developments in the town include replicas of The White House, Sydney Opera House, as well as buildings from Tiananmen Square. Huaxi's replica Great Wall, 100 miles from Shanghai. Over the last 40-years Huaxi has transformed itself from a rural backwater to a multibillion dollar collectively-owned company, earning itself the title of “China’s richest village.” Villagers own investments in steel, shipping, tobacco and textiles, The Guardian reported. Huaxi's version of the iconic Sydney Opera House. The village’s 2,000 residents receive shares in Huaxi’s commercial operations. The village owns several factories, staffed with migrants from other parts of China. 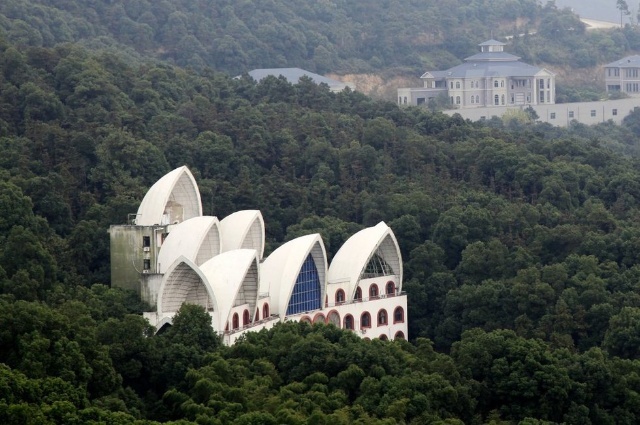 Former village chief, Wu Renbao, delivers a daily lecture in a building designed to resemble the Great Hall of the People, according to the Guardian. Last week Wu officially unveiled a 72 story skyscraper built in the center of the village, which is slightly taller than the Chrysler Building in Manhattan. The building contains a statue of a Buffalo cast from solid gold. Thanks to spiraling gold prices, the value of the statue increased by 70 million renminbi ($10.7 million) last year, the New York Times reported. Higher quality photographs of Huaxi’s new buildings can be found on Chinese website QQ.com.